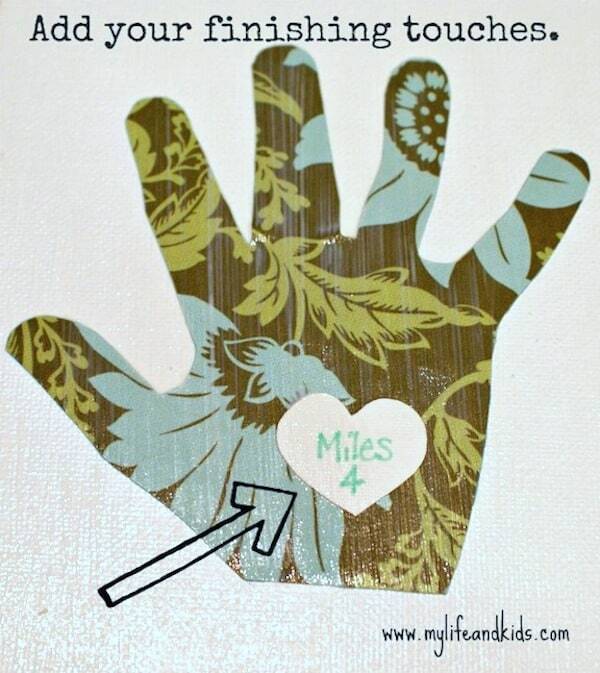 This Mother's Day craft is one that you can treasure year after year – use this cute handprint art to measure the growth of your children! I LOVE Anna from My Life and Kids. She is hilarious! She's also a great Mod Podger. 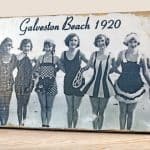 Do you remember her Pottery Barn knock-off LOVE canvas or her joyful holiday tray? Anna is really good. 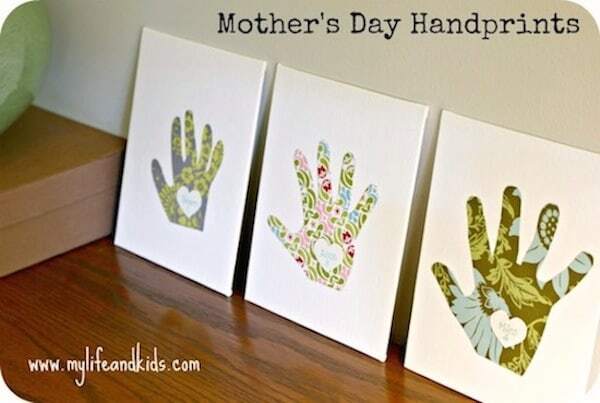 She is back with a Mothers day craft for kids, and you are going to love this handprint art as well. 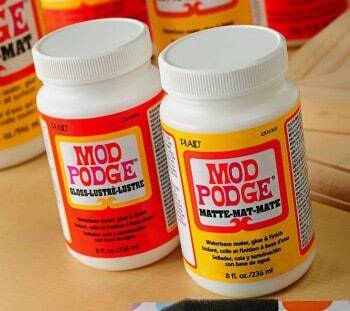 Hi, my name is Anna, and I *love* Mod Podge (almost as much as I love eating Crisco out the can). I had three kids in three years, and now I spend my days wearing mom jeans, driving a minivan and blogging at My Life and Kids. I drive my mother nuts, exercise in my underwear, and sometimes I can be serious. For the past two Mother's Days, I've made a very special project for myself: handprint art. Our tradition is only two years old, but I know it's one that will last. 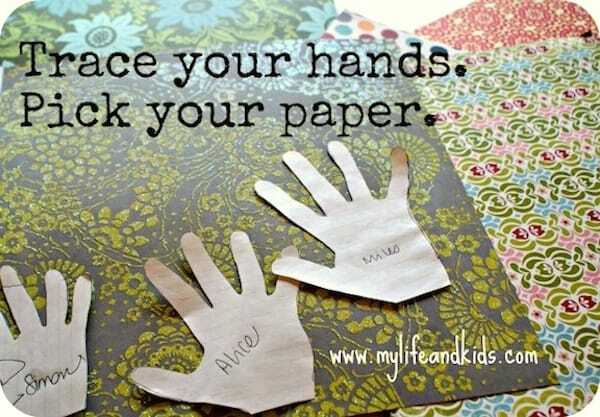 Step 1: Trace your kids' hands on any paper you can find. Choose your scrapbook paper. I like to use Amy Butler scrapbook paper in coordinating prints. Step 2: Trace your kids' hands onto the paper you chose. Cut them out. Step 4: Place your scrapbook paper hand on the canvas. 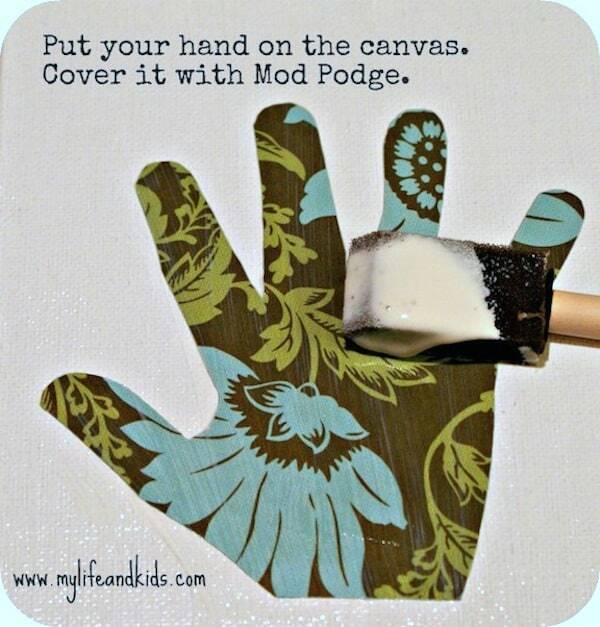 Cover it with Mod Podge. Step 5: Add your finishing touches. I like to add a small heart in the palm of each hand with the child's name and age. I add another coat of Mod Podge to keep it in place. Step 6: Repeat as necessary with each hand. Let them dry for 24 hours. 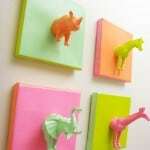 Hang them on your “handprint” wall and see how much your children have grown in just one year! Try not to cry. Thanks for having me Amy! 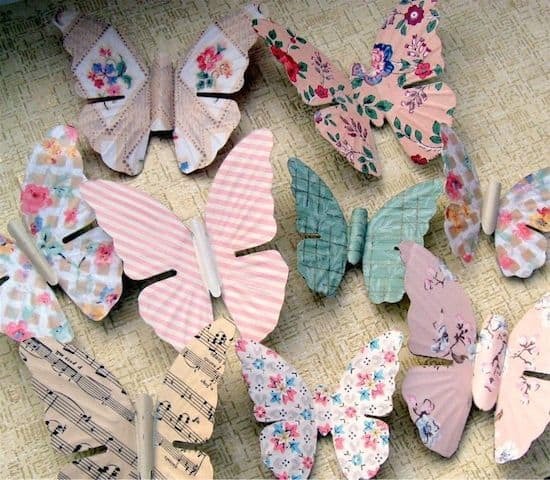 It's always fun at Mod Podge Rocks! How adorable….I love this idea….thank you for sharing…. Thanks so much for having me Amy!! I must admit I’m pretty sick of handprint crafts (except, of course, my OWN son’s handprint artwork). 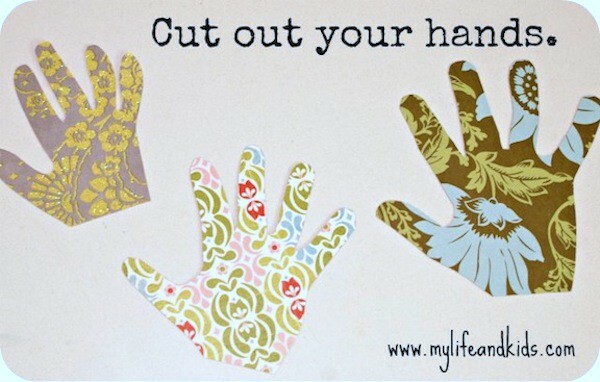 But cutting them out of patterned paper really makes them attractive. Nice idea. I wonder if a spin off could be letting the kids make the patterned paper you cut them from, which, of course, would change in appearance over the years. Always fun to do something each year that shows growth. So cute. Great tutorial! Thanks for taking the time to share it with us. So awesome and easy too! Thanks for anoter great idea Anna! I just love this! What an awesome way to watch the kids grow through the years. Such a great keepsake. 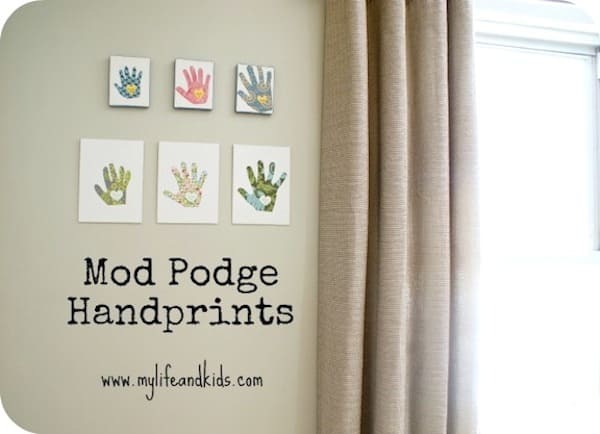 Great project, and of course I love handprint art!! Beautiful!! 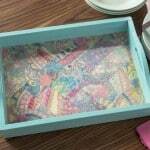 I would like to invite you to share at my Mother’s Day Gift Idea link party at http://craftymomsshare.blogspot.com/2012/05/mothers-day-gifts.html. Thank you!! Happy Mother’s Day! I just finished the project, it took me a whole 20 minutes for a pricless gift! Were on a tight budget & the canvases were kinda pricey so I just bought an 8 x 20 canvas and put all the kids on one canvas. I love it! Thank you soo much for posting! P.s. it was my first time using mod podge, I loved it! What a great and meaningful idea! absolutely love this. Going to make this with my grandchildren in the morning to give to their moms for Mother’s Day. I’ve been trying to find something to do with them for my daughters and this is perfect. Thank you for the inspiration. 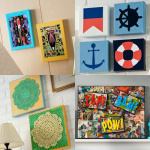 Your canvases are so beautiful. My children put their own artistic spin on their canvas hand prints. Again, thank your for sharing. You rock! 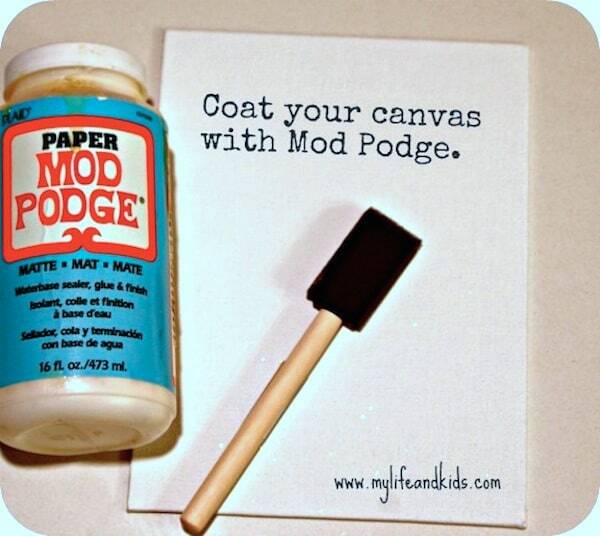 I plan on doing this as Chrismas presents to the grandparents, but I wanted to write a personalized message on the canvas as well, can I mod podge over the entire canvas after I have written on it, or will that smear whatever is written? Thank you!